I discussed in detail in the 114th and 115th issues of this series how to convert salt to fertilizer, that is, the application of the atomic transformation of EM, and soon many people involved in using EM took up the challenge. The people who implemented thisregard it as miraculous, and the ultimate form of agriculture has begun to become a reality. It is necessary to link this achievement to the essential solution of environmental problems, which is the goal of the Universal Village International Conference. As already mentioned, organic materials generated from nature can be recycled with higher added value through the application of EM technology, but we must also find solutions to the reality that recycling is difficult, especially such materials as plastics, petroleum-derived products, large amounts of garbage that washes up on the coast, timber that contains large amounts of salt, and so on. We also need to consider the problem of oceanic microplastic contamination that was raised at the Universal Village International Conference. This means the development of materials that replace plastic but do not pollute the environment, and advanced reuse of discarded plastic. With regard to the former, although this can be dealt withthrough the use of Carbon nanofiber technology and the application of EM technology at the time of plastic processing, the amount of plastic-related garbage discharged every day is staggering, the cost is enormous, and we continue to increase unseen environmental pollution. Fortunately, any petroleum-derived waste can be processed and carbonized at high temperature. If the harmless carbide is treated with EM and utilized as the kind of optimum soil functional material and soil improvement material that I have been discussing, this will directly lead to an essential solution. <Manufacturer’s catalog > *Click the image to enlarge. Naturally, carbide remains stable in the soil, and while exerting its functionality it does not turn into carbon dioxide (CO2), so this is the ultimate measure to reduce CO2gas. If we add rectification or rectified coal through EM technology to plastic waste,“Sumizo kun” has multipurpose uses. First of all, below is the range of equipmentfrom the manufacturer’s catalog. The manufacturerhas not indicatedthe carbonization of plastics in this system, but they have accepted my proposal and the device can respond to this. Basically, when sealed plastic is steamed at 500 - 600 ℃, this generates combustion gas. When introducing the gas into the secondary combustion furnace and adding EM rectification technology, it completely burns, and dioxin etc.is not generated at all and it can be applied as a power generation system. Therefore, the fuel consumption of the combustion furnace and its operationare quite efficient. Carbonization is possible within one hour if the temperature is raised, then sprayit with a 5 – 10 dilution of activated EM cultured with seawater, and after cooling, pack it in bags immediately. <“Sumizo-kun” operation procedure> *Click the image to enlarge. This method does not require drying, and can be used in many ways as material in various environmental measures (purification of rivers and seas, bedding such as in parks). 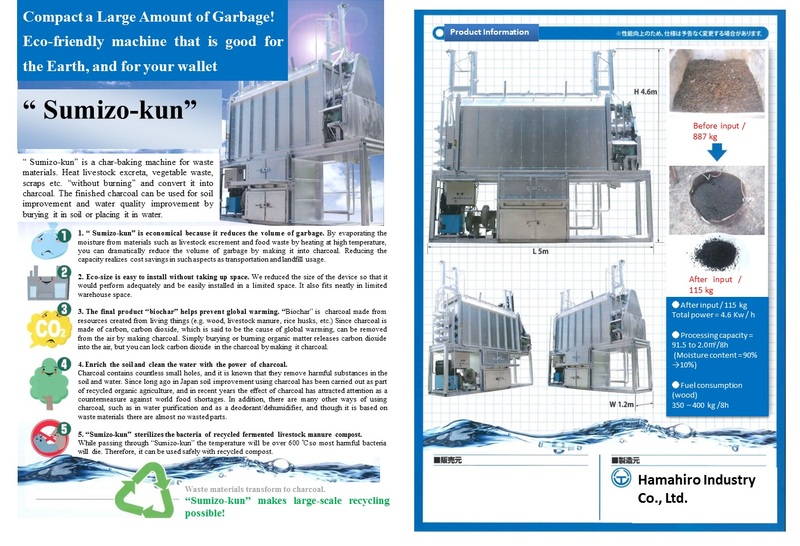 As a result, it can be utilized many times more efficienctly than the method guaranteed by the manufacturer, so most waste problems can be solved at an extremely low cost, and it is also easy to create a system that does not createany waste and secondary environment pollution as in the past. Remote islands have much stray garbage that washes up, and even if local resources are poor, using “Sumizo kun”allows them toutilize seawater to create fertilizer, soil improvement material and other functional materials, and it is easy to develop primary industries with high yields at extremely low cost. In order to further spread such activities, the manufacturer and the EM Research Organization are working in tandem to provide technical guidance and industrial promotion where the use of this device has been implemented.